Driscoll’s. Panna cotta is an Italian dessert whose name means “cooked cream.” The heavy cream and eggs form one of the different types of custard. This recipe, from Driscoll’s Berries, adds rum and brandy, ingredients of eggnog; and creates individual portions in ramekins. The puddings get a festive finish with a topping of colorful, sweet-tart balsamic raspberries. Prep time is 1 hour, chill time is 2 hours. Find more delicious recipes at Driscolls.com. 1. LIGHTLY OIL six 3/4-cup ramekins or custard cups. 2. SPRINKLE gelatin over 1/4 cup milk in a small bowl. Let it stand until the gelatin softens, about 5 minutes. 3. PLACE a fine mesh sieve over a heatproof bowl near the stove. Whisk the egg yolks and sugar in a second heatproof bowl until combined. Heat the cream and the remaining 3/4 cup milk in a medium saucepan over medium heat, stirring often, until simmering. 4. GRADUALLY WHISK the hot cream mixture into the egg mixture. Return the mixture to the saucepan. Cook over low heat, stirring constantly with a wooden spoon, until the mixture coats the spoon (a finger run through the custard on the spoon will cut a swath) and an instant-read thermometer reads 185°F, about 3 minutes. 5. POUR through the sieve into bowl. Discard any bits of cooked egg white in the sieve. Add the gelatin-milk mixture and rum extract to the cream mixture and whisk until gelatin is completely dissolved, about 1 minute. Let stand 5 minutes to cool slightly. 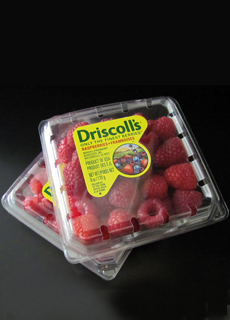 Driscoll’s raspberries are available nationwide. Photo courtesy IMBlogger.net. 6. DIVIDE the cream mixture evenly among ramekins. Cover each with plastic wrap. Refrigerate until chilled and set, at least 2 hours. 7. MAKE the balsamic raspberries: Whisk the brown sugar and balsamic vinegar together in a medium bowl to dissolve the sugar. Stir in the raspberries. Let stand at room temperature for at least 15 minutes and up to 2 hours. 8. ASSEMBLE: To unmold each panna cotta, run a dinner knife around the inside of the ramekin to release the panna cotta. Hold a dessert plate firmly over the ramekin and invert the plate and ramekin together. Shake firmly to unmold the panna cotta onto the plate. 9. 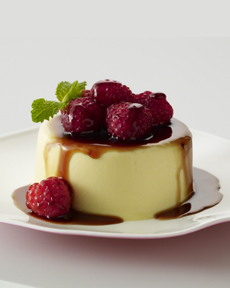 TOP each panna cotta with an equal amount of raspberries and their juices. Serve immediately.